Get rid of all that speaker wire! Home Theater and surround sound is great, but having to run all that speaker wire to 5 or more speakers and then finding ways to hide them from view can be frustrating. The Enclave CineHome HD 5.1 Wire-Free Home Theater-in-a-Box is one of a small, but increasing number of home theater system options that incorporate wireless speakers - but is it up to the task? The Enclave CineHome HD outwardly looks like most home-theater-in-a-box systems. It comes with five speakers (center, left, right, left surround, right surround) and a powered subwoofer. However, there is something different. Unlike most packaged home theater systems, all the speakers are powered. This means that each speaker in the system not only houses the speaker drivers but also houses its own built-in amplifier. In addition, each speaker (with the exception of the center channel speaker - more on that in the next section) has a built-in wireless receiver (bye-bye speaker wire). However, although the speaker wire clutter is eliminated, because of the power needed for the built-in amplifier and wireless receivers - each speaker comes with a detachable power supply, which must be plugged into an AC outlet. In other words, you are trading speaker wire for AC power cords, which means that each speaker needs to close to an AC outlet. In addition to its role as a speaker, the center channel speaker is also the hub of the system (referred to as the Smart Center). In addition to its own built-in drivers and amplifier, it also has wireless transmitters that send audio signals to the other 4 speakers and the subwoofer. The CineHome HD Smart Center uses is the 5.2-5.8GHz band for wireless transmission, but is not the same technology that is used for WiFi transmission. Audio Processing - Dolby Pro Logic II, Dolby Dynamic Range Control (Dynamic Compression), Bluetooth, Analog (via RCA-to-3.5mm adapter). Connectivity - There are 3 HDMI inputs and 1 HDMI output - 3D and 4K pass-through are supported, and, for audio, ARC (Audio Return Channel) is supported. Additional connections include 1 Digital Optical audio input, and 1 analog stereo input (3.5mm). In addition, the Smart Center Speaker unit also incorporates Bluetooth - which allows direct wireless streaming from compatible portable devices, such as smartphones and tablets. Via the Enclave Audio App for iOS or Android, users can stream locally stored music via Bluetooth, along with a choice of streaming music services such as TuneIn Radio, Spotify, Soundcloud, and Tidal. As an added bonus, wireless AV casting from a smartphone is accessible when a Chromecast device is plugged into one of the HDMI ports. In addition to the speakers and subwoofer, other things that you get in the Enclave CineHome HD package include: 6 AC Power Supplies with cords, 1 HDMI Cable, Remote Control (provides basic functions, as well as access to the onscreen menu system), Owner's Manual, Quick Start Guide, and Warranty documentation. For easy setup, each speaker is identified on the back as to their placement requirements: SmartCenter (SC), Left Front (LF), Right Front (RF), Left Rear (LR), Right Rear (RR), and Subwoofer. Once you have all of the speakers plugged in and placed where you want them (also make sure you connect the Smart Center Channel's HDMI output to your TV or video projector so you can access the onscreen menu) all you have to do is power up the Smart Center Speaker - and it will automatically search for each speaker and perform the pairing process. One that is done, you are set to go. However, if you find that the sound balance needs further adjusting, you can access the system's built-in test tone generator, which enables you set the volume level for each speaker and subwoofer via a "hidden" menu - refer to user manual for details. Now that you have a rundown on the Enclave CineHome HD system's features and how to set it up - the remaining question is: "How does it sound"? Using the Enclave CineHome HD, it was found that it delivered clear sound for both movies and music. The center channel movie dialog and music vocals were distinct and natural, although, there is a steady drop-off at the higher frequencies above 12Khz. For movies and video programming, the system performs well. When playing two-channel material the front soundstage is wide and accurate. For surround sound content, directional sound and ambiance cues project well into the room, thus really broadening both the front soundstage providing an immersive surround sound listening experience. Also, the blend of sound from front to rear was very seamless - there were no obvious sound dips as sound moved from front to back or around the room. The subwoofer was a good match for the rest of the speakers, both physically and audibly - definitely not there to just provide a modest thump or overly boomy effect, as on some soundbar/subwoofer systems. Using the combination of the subwoofer phase and frequency sweep tests provided on the Digital Video Essentials Test Disc, a faint low-frequency output started at 30Hz increasing to normal listening levels beginning at 40Hz. The subwoofer crosses over to the rest of the speakers between 80Hz and 90Hz, all of which are good results for this type of system. For music, the subwoofer also provided a strong bass output, although in the lowest frequencies, subwoofer texture, particularly with acoustic bass, was somewhat subdued - but still tight. On the other hand, in the upper bass region (60-70Hz) the subwoofer was not overly boomy - providing clarity, as well as a smooth transition from the mid and upper bass region to the upper bass/lower midrange capability of the satellite speakers. With Dolby and DTS-related movie soundtracks, the system did a great job reproducing both main front channels and surround effects, as well as providing good overall bass. Dolby TrueHD and DTS-HD Master Audio decoding are not provided - system defaults to standard Dolby Digital or DTS. Also, using an HTC One M8 Harman Kardon Edition Smartphone, it was easy to confirm the CineHome HD's Bluetooth capability and stream music tracks to the system with acceptable sound quality. It was a disappointment that Enclave Audio did not provide a statement regarding power output specifications, but the system delivered average listening levels for a small (12x13 ft) to medium (15x20 ft) size room. Conforms to the WiSA wireless speaker standard. Good overall sound quality - but a little subdued at higher frequencies. No noticeable lip-synch problems, despite wireless connectivity. Easy to set up - very well illustrated User Manual and Quick Start Guide. All speakers (and subwoofer) are "wireless". Built-in Test Tone Generator to aid in speaker setup. The system provides access to audio content stored on Bluetooth-enabled portable source devices. The mobile app provides access to additional music streaming services, via Bluetooth and when a Chromecast Device plugged into one of the HDMI ports. HDMI video pass-through is provided (no extra video processing or upscaling) with the HDMI-based onscreen menu system. The innovative idea of combining the center channel speaker with other "central hub" features, such as source input, control, and access to on-screen menu operation. Even though all the speakers and subwoofer are independently powered, they all turn on/shut off as a group when the Smart Center is activated. Although the need for speaker wire is eliminated - each speaker has to be connected to AC power via a power cord. Although overall sound quality is good for a home-theater-in-a-box system, high frequencies and transient sounds are a little subdued, compared to the mid-range and bass. The subwoofer provides good low-frequency bass response but did exhibit a mild level dip at about 50Hz. No Dolby TrueHD or DTS-HD Master Audio decoding. Onscreen menu kind of skimpy - Access to individual speaker level settings not intuitive. At about $1,000 the CineHome HD is higher-priced than an equivalent performing "wired" home-theater-in-a-box system - but less expensive than other wireless home theater speaker systems using WiSA technology. Speaker Drivers: 1 20mm tweeter, 2 80mm mid-range/woofers. Speaker Drivers: One 20mm tweeter, 2 80mm mid-range/woofers. Cabinet Dimensions (HWD): 12.4 x 4.7 x 7.7 in. Speaker Drivers: 2 50mm full-range drivers. Enclave Audio did not provide power output specifications for the built-in amplifiers incorporated into the speaker cabinets. The Enclave CineHome HD definitely advances the cause for wireless home theater audio system and speaker options. However, it is designed as a basic system, and although it does incorporate some interesting features, the "Smart Center" does not include everything you would find in a true home theater receiver. On the other hand, as with any new product concept, you have to start somewhere, and for mainstream consumers, the CineHome HD provides a good starting point - with the hope that will be a lot more to come in the wireless home theater speaker/system product category from Enclave and others. 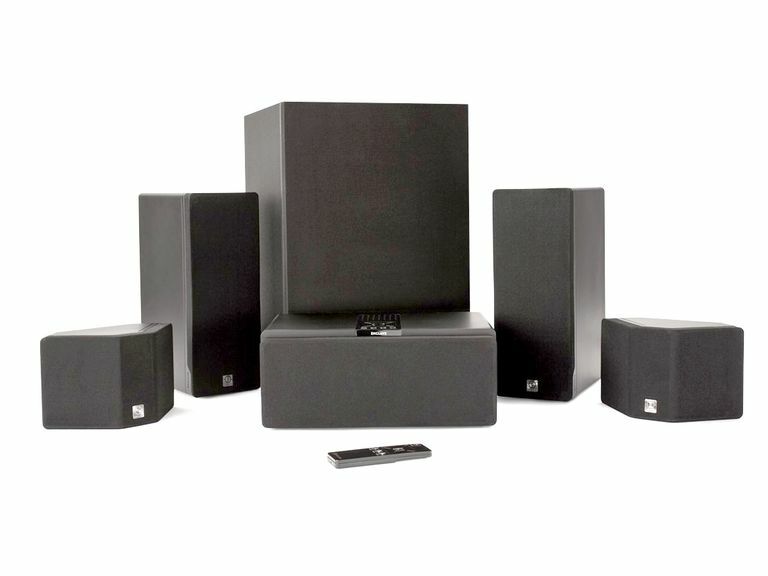 Taking all into consideration, if you are looking for a home theater audio solution that is really easy to set up - and eliminates unsightly speaker wire, the Enclave Audio CineHome 5.1 Wire-Free Home Theater-in-a-box System is definitely worth checking out - it is certainly a step up from a sound bar or sound base, by providing a more effective surround sound listening experience, as well as being almost as easy to set up and use. Disclosure: Review samples were provided by the manufacturer and returned upon completion of the review.